You might ask, What's the big deal about spatulas? A spatula is a spatula, right? Up until recently, I might have said so. I've tried dozens of spatulas over the years (as you may know, I have a serious gadget habit), and this is the first one I've been completely happy with. The biggest problem with most spatulas is that they are a silly two-piece design. If you've ever had the business end pop off the handle and get stuck in whatever you're making, you know what I'm talking about. Or you might not have realized it was a two-piece gadget until you were washing it one day and it came apart and you spotted moldy gunk inside! A few one-piece spatulas have found their way into my kitchen and have quickly been shown the way out! They were so rigid as to be completely useless. I always thought, Why can't someone make a good spatula? Well, someone finally did. GIR, ProductofGIR.com. Love these unibody silicone tools! One piece of molded food-grade silicone with reinforced interiors, heat-proof to 464 degrees, eco-friendly material, BPA-free, easy to clean and dishwasher safe. This giveaway is open to readers everywhere in the world! The Ultimate Spatula is the one to start with, the one most home cooks would use most frequently. There's also the Skinny, perfect for blender jars or scraping the last of the mayonnaise out of the tall jar; the Mini, just what's needed for getting all the tomato paste out of those tiny cans or scraping small measuring cups; and the Pro, really hefty for big jobs. And there's the Scraper (bowl scraper and bench scraper), which also serves as a ruler; the Ultimate Spoon, which I'm expecting to become a firm favorite; the Ultimate Flip and Pro Flip, both of which look great for right-handers (I'm a leftie, but my husband can use them for outdoor grilling); and the Silicone Lids, which can be used for cooking or storage. The entire line comes in an array of beautiful colors, but what color did I choose? Black. For every single item, black. If you win the giveaway, you might want to be a little more adventurous than I! The spatulas may be more expensive than other brands, but they are guaranteed for life. This giveaway is open to readers everywhere in the world! One winner will receive a 5-piece set of kitchen tools from GIR, all four different spatulas plus the new Ultimate spoon in your choice of color(s); you may choose a different color for each! All readers who leave a comment about spatulas (one entry per person - and please include your email address in the body of your comment) on this post before 11:59 pm Eastern time Wednesday November 5 will be put into a random drawing. Winner will be announced here in the comments before noon Eastern time on Thursday November 6. If I don't hear back from the winner of the random drawing by 11:59 am Eastern time Sunday November 9, another drawing will be held and a new winner selected from the original entrants (those who commented before the giveaway deadline). Buy It Now GIR kitchen tools, including the Ultimate spatula, are available on Amazon. Disclosure: Though GIR provided silicone kitchen tools for review purposes and for the giveaway, the views expressed here are entirely my own. I always tell my readers what I really think! You find the most interesting things, Jean! I like my Paula Dean spatulas (rubber scrapers?) but the two-piece design always makes me wonder what germs are lurking under the handle. :-( I'd love to be entered in the giveaway! Kristie, I'm so glad this giveaway is open to all countries! 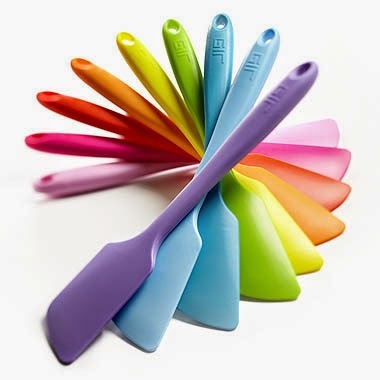 Love these colourful spatulas. I think Spatulas are actually the most useful tool in the kitchen. how did the cavemen cope without them??? Spatulas are such workhorses in my kitchen. I have one two-piece one that has a silicone top that I love using. But I stuck it too far into the blender (oops) and it has a nick in it. Others are too hard or too flimsy. One I bought recently has a beautiful wooden handle but it's way too heavy for efficient scraping. Lorrie, sounds like you definitely need to try these! Yikes, Cheryl! I'd want to bill the maker of that spatula for my time and materials! "Life is too short to use any ordinary spatula." I love that, Colleen! Not certain, but you just might be my very first commenter ever from South Africa. It looks like I'm going to have to check in here rather frequently, your blog isn't updating on my feed! I'm not going to be greedy and enter this giveaway, (although the spatulas look wonderful)really, what I wanted to do was say hello and thank you for all your kind words! Mine are all plain - but also very useful. Jacqueline, thank you. I post every Thursday morning, just to keep things simple! I have a serious gadget habit too and wonder how did I get so picky about such things!? These beauties would be wonderful to have and use in my kitchen. Love the color-factor! Rusthawk, it's not the *worst* habit we could have, right?! Mine's genetic, can't be helped! Wow Jean! I'm impressed! What a wonderful giveaway! I always hunt for the one-piece spatulas, but they are so difficult to find in my area. I love this collection! Absolutely gorgeous! Of course I'd love to win one ;) I'm so happy the giveaway is valid internationally! Awesome! Renata, yes, I was thrilled to be able to offer the giveaway internationally! Cooks everywhere are going to love this set! Can't imagine my kitchen without having a few of spatulas! Why do I feel so relieved whilst reading your blog today? At last, a spatula that really works! I find that one spatula is not always enough during one cooking session and am rather fussy about this small item in the kitchen. Thanks for sharing the advice, and thanks for making it possible for South Arican readers to participate. I love the colors available! So much fun. Elmarie, I was so happy to be able to open this up to readers everywhere! Madeline, all these fabulous colors, and I got every single piece in black! What was I thinking?! I am sure Jimi could have found a way of playing his guitar with one of those. Just discovered, Jean, that the inventor of the Octavia, the acoustic sound system many great gutarists emplyed including Jimi, Jeff Beck ,Eric and many others was a gentleman called John Meyer who lives at 15 Salisbury Road Worcester Park. That is about a mile and half from where I live. The above is the address of his main office. He was a sound and vibration engineer who worked for the Royal Navy. When he retired from the navy he branched out into creating acoustic effects for Rock musicians. I will write an article about him. Tony, got your PS too changing that to Roger Meyer. Interesting! Stephanie, that sounds like a wonderful use for these spatulas. If you make big batches in deep pots, the Pro will be perfect. Thanks for bringing those tunes to mind! Love them both! You can use spatulas to stir food when you're saute-ing or boiling or whatever. And to scrape the meringue out of the bowl and arrange it on top of your lemon meringue pies! And, Rachel, what's special about these silicone spatulas is that they are one-piece with silicone handles as well, so the handles are not going to melt or burn. Spatulas are vital to our work, and these look well crafted. Thanks for sharing them with us. Happy Halloween to you & yours! Thanks, Brooks! I had given up on ever finding a spatula I could tolerate, let alone one I could get excited about! Those spatulas would be very welcome in my kitchen. Bruce, I'm sure you will love them! Renuka, sounds like your husband and I would get along well! :D You will love this spatula; it really is something special. I love colour in my kitchen. I have 12 different coloured single serving sets of Fiesta dishes. So what I'm saying is these kitchen tools are perfect for me and the spatula would especially fit perfectly into my kitchen decor. Jennifer, you DO like colour! I envy you your Fiesta collection! You are so right about spatulas that come apart - I'm always quite disgusted at how dirty they can get. Love the look of these and I would choose red for at least one of mine if I was lucky enough to win - crossing fingers! Choclette, I know you could put these tools to good use with all your yummy chocolate creations! Amy, so glad you got in on this -- these are great tools! OK, it would definitely be the purple for me if I could pick! Usually, I find spatulas are too floppy - my favourite one doesn't flex too much when I'm trying to persuade my efforts to move. And yes, it's black :) But I would love to try these. Purple -- you're a wild woman, Pauline! I'd probably go for the red. Martina, these spatulas are perfect for making all those delicious variations on tiramisu in your lovely tiramisu cookbook! Good girl, Leigh! My Grandma would be proud of you! I hate waste, too; so I've been loving the Mini and the Skinny to really clean out jars. Wow! I think I need a new set of tools! Pom Pom, great kitchen tools make life so much easier! I've had that 'pop off' happen to me. Don't you just hate that. LOL! Now I have Betty Crocker's one piece spatula. And maybe you'll have this set, too, Pat! Can't have too many. *Giveaway Winner Announced* - The winner, by random drawing, of the kitchen tools is Lorrie. Lorrie, as soon as you send me, delightfulrepast at aol dot com, your name, address and phone number (required by shipper), GIR will ship the kitchen tools to you. Congratulations! If I don't hear from the winner of the random drawing by 11:59 am Eastern time Sunday, November 9, another drawing will be held and a new winner selected from among the original entrants (those who commented before the giveaway deadline). Watch for my next giveaway! 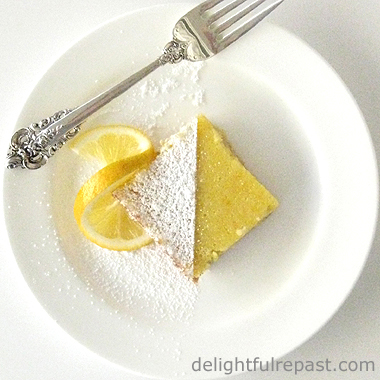 In the meantime, follow me on Google and onTwitter (@delightfulrepas). You can even use the Follow Me By Email button in the right column. I wished I checked your site earlier... I'm always on the hunt for good spatulas! Thanks, ticket! I post just once a week, on Thursday, and do great giveaways from time to time. Congrats to Lorrie! I sure loved this giveaway! Thanks! Diane, thank you. You are sooooo sweet! I don't like the two piece designs and always take them apart to wash. These are so much better. Maureen, I am just loving all these spatulas every day!